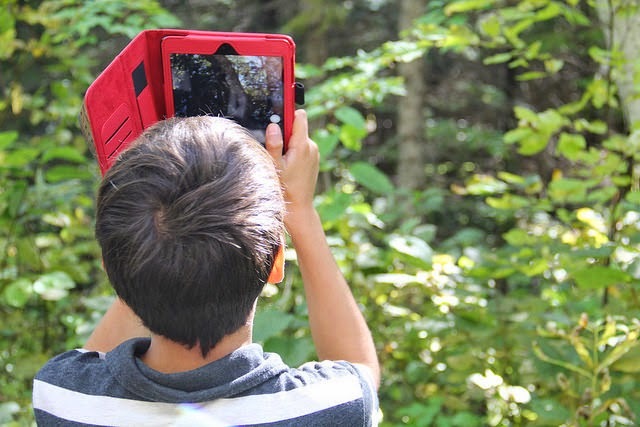 Nature is found in abundance in Maine, and it makes an excellent source of learning. (I would say duh, but I realize that this needs to be stated up front,because we find ourselves in a culture of attaining knowledge from secondary sources, when primary sources are right outside the door). To experience nature, you simply must go outside. I refrain from a second "duh". Many of my friends are from Washington County, Maine, a place where outside is much bigger and more exciting than inside. As kids, we didn't spend time building worlds in Minecraft, we built them outside. From this play we learned about the natural world. Raise your hand if you also worked outside in Washington County. Nature for people from there is both companion and sustenance. So, I refrain from "duh". Not everyone had that experience, I call it the book of Maine experience. Four seasons, seasonal labor, seasonal abundance, seasonal slow down, you learn the rhythms of life that way, and you pay attention to the signs. As my project comes to a close, I am sorting data, identifying excellence, tracing back to the root. My top plant scientists, defined as the ones who had the most robust and diverse plant collection, can be traced back to one teacher, who wrote: "I am just a humble teacher from rural Maine!" on the original application that she submitted, three years ago now. Twice I visited her classroom, driving past Katahdin coming and going, finding myself surrounded by rolling fields that folded into hills and blue sky. Both visits she chose to bring her students outside, and we visited the Nordic Heritage Sport Club and the Aroostook Wildlife Refuge. The second trip, that bus ride after lunch with seventh graders going to the refuge was INSANE. To every chaperones' credit we grinned and bore it, because soon we were released into the wild, and the kids had a purpose and a plan and a wide expanse to roam. Some ran. Some skipped rocks. Many found sticks. All stopped and collected data. Many parents were involved and so was the bus driver. We were all looking for signs, signs of things we didn't know much about yet. The ride home was the reverse: it was almost reverent. She taught the book of Maine. It worked its magic. Get outside today with your students.